MUFF WIGGLER :: View topic - Should we keep making F-1 pedals? Should we keep making F-1 pedals? The boards ran out and I'm debating whether it's worth the trouble to reorder. They have been selling rather slowly for the past 18 months. And in case you wondered: a high proportion of F-1 buyers make the "it's broken" complaints. Well If you would make another pedal with the multimode filter I would be quite glad. Especially when combineer with the horsecock and the circuit in the r51. But aint that asking too much? That's a pretty weird and specific combination. Can you explain why it would be so desirable? I'm seriously interested. But could understand it going the way to other things. The RK stuff seems to have more interesting distortion options. Love that single dial of the F1 though, especially on the more subtle settings, and the actual whine sound it makes when you adjust the dial is splendid. It's still one of my favorite sales pitches Metasonix ever has done, "imagine blowing up your amp over and over" ha. Other people's loss for not getting one. I do want one, but probably won't have the spare cash at this point until summer or at least later spring. If it'd be keeping from making other newer things though, make those instead. My fault for slacking on grabbing one. Was thinking last night: What about a pedal that could accept any one metasonix rk module of a user's choice, to make it self-contained? would that work with the existing F1 cases? I got a self-contained euclidean circles this way from Vlad and I really dig it. Why wierd? two different flavours of tube vca distortion? but then I´d need to go eurorack again. It's possible and I've thought about doing it--but it won't be a cheap gadget. Would cost a LOT more than Doepfer's A-100 minicase. The F1 cabinet is too small even for one module, so a pedal for modules would have to be a lot bigger. If we go to a larger box, like the one that held the TM devices, there's room enough for three 8HP modules. 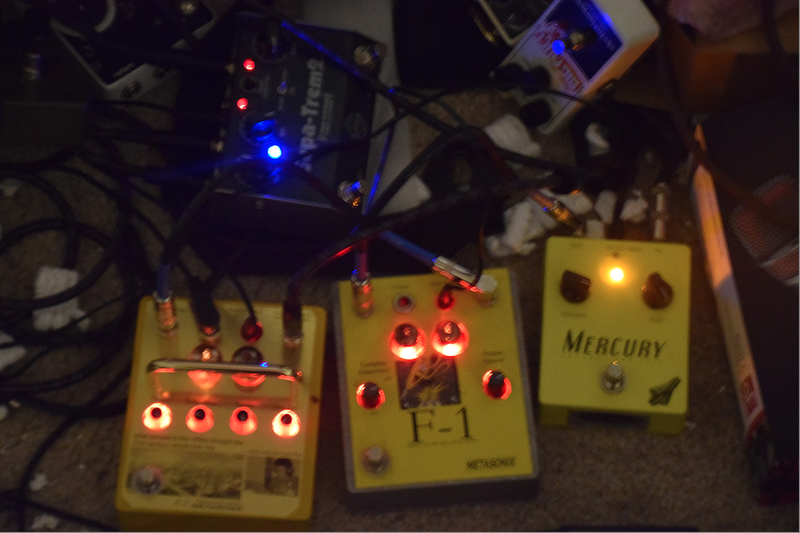 And how does one go from the 1/8 jacks on the modules to 1/4 cables used with pedals? How do you handle the bypass switch? Retail $349--no way I can beat that. I'm kind of cringing looking at that case. It's a cool idea for sure, but if you actually want to gig with it you need some way of protecting the modules from rogue feet/audience members/beer/etc. Heh heh....when has that ever stopped musicians? I would love to see a Euro version of the F1 or iCunt since they have 2 tubes it seems feasible. Can u make me sound like Eric Clapton? You'll need 2 iCunts for that. already got one - so don't care. :edit: wouldn't it be nice to see the something like the kv-100 come back to the metasonix lineup (or perhaps be reincarnated into kv-200), though? Huh! That got me looking at that. Looks like they discontinued it in 2015. Seems to have had uneven reviews; people loved the idea but there were noise and compatibility issues and it was more shallow than a skiff, other complaints. Not sure if its doable, of course, but I agree - resuming the TM-7 in that F1 case format would be terrific. Do it for the scrotums! it's a pretty awesome mod if i do say so myself I've gotten a lot of use out of it! F-1 sounded really, really great for me tonight! i think i could be interested in a second unit, especially if the new ones get the upgrades in trim (e.g. spray-painted box, metal foil panel-sticker, illuminated knobs, chrome roll-bar, fu package-sticker, etc.) from the F-2... or even if they don't. so please subtract one from the 'don't care' tally. and add one to 'yeah' count. F-1 just totally s having a fuzz pedal in front, which takes things from its characteristic squelchy "fart-zap" zippery kind of distorted tone at the tails of guitar notes (especially lower notes), with the opposite effect of sustain, to this glorious otherworldly wall of interstellar rattlesnakes with occasional bursts of springy metallic shrieking and squealing errupting forth (for lack of better description - words don't really suffice). you don't even have to play any notes. you can just blow on the strings, or hold the body of the guitar with both hands while gently shaking it it a few times... and then all hell breaks loose for a half a minute or so. and then it just drones away with the F-2 providing a lovely halo of warm sounding pedal controlled feedback at the end of the chain. it's so beautiful! it would be really cool if you could add a simple germanium diode fuzz circuit to the F-1 with its controls in the center and with its own separate footswitch on the right. I bought a second one in order to have two! Aaaaand I see the F1 page is no longer on the metasonix site. I'm guessing it's now out of production? Thanks for a great run on this pedal, Eric. It got me into your gear, personally, and think it was a really nice gate of entry for your products. Gnarly beautiful thing, too - you can even play it like a synthesizer if you send note CV into the CV input. And it just destroys CNN when you play the news through it. I do feel the RK2 is somewhat more uncanny as a distortion device, but that only means you outdid yourself. (Ha it even has a more offensive nickname) But the F1 won't go anywhere; it's still unique and really wonderful, especially in a pedal chain. 'No one else can do it' very much indeed. Can't wait to see what follows! I ummed and ah'd about this since it first came out. I've been buying different distortion pedals recently so thought why not, especially if they're going out of production. It is *really* picky about inputs, even more then fuzz pedals. At first I could only get it to squeal but I put it into a pedal chain with a re-amping box and that sorted it. It sounds like an extreme distortion ...gone wrong. What realm are you using to put it after effects pedals?